It's axiomatic to say that late-season momentum bodes well for a team in the playoffs. That's a debatable statement in itself, one I'll probably explore further at the end of the season. Of course, whatever momentum may or may not exist is totally irrelevant if the team does not actually make the playoffs. The playoffs reward the teams that have performed best over the course of a 16-game season, but due to injuries and player development, the 16-game sample does not really accurately reflect team strengths by the end of the year. It's why Football Outsiders has weighted DVOA to quantify a team's recent performance. 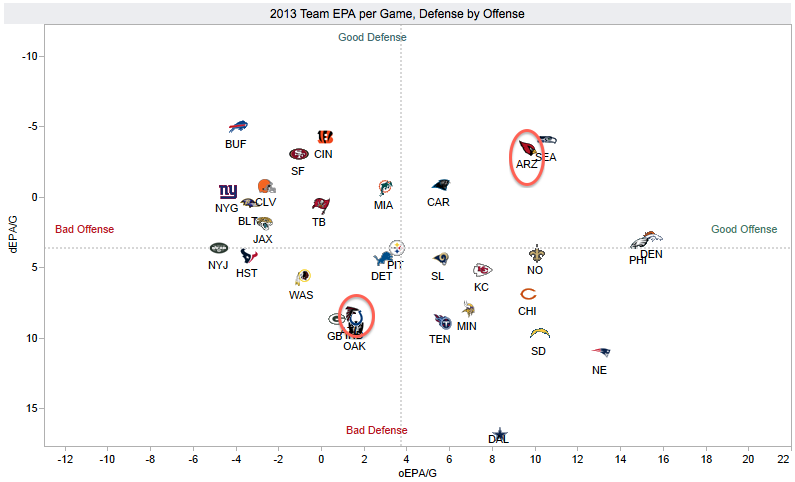 Yes, the Arizona Cardinals are neck-and-neck with the Seahawks as the most well-rounded team in the second half. Arizona's defense has been consistently great all year—though the absence of moveable Joker piece Tyrann Mathieu hurts—but the jump is due to substantial improvement from a surprising source. Apart from the Philly loss, Palmer has been excellent. Palmer has put up an average of 12.3 EPA per game since Arizona's Week 9 bye. That would be the third-highest EPA per game among quarterbacks this season, behind only Peyton Manning and Josh McCown. More importantly, Palmer has been interception-free in four of the last five games. Considering he threw 14 picks the first eight games, the turnaround is a veritable shock. It's questionable whether that will hold up—Palmer's interception rate in the second half sits at a miniscule 1.4 percent, whereas his first half rate was 4.9 percent, and his rate over 2,649 throws from 2007-12 was 3.3 percent. But at least for a few games, Palmer has turned the clock back to 2005. Alas, Arizona needs a borderline miracle to sneak into one of the wild cards. The Cardinals need to sweep their final two games—at Seattle and home against San Francisco. Even if Arizona wins both those games, they need the loser of next week's Carolina-New Orleans game to drop their Week 17 contest. The Panthers visit the Falcons, and the Saints host the Bucs. Alternatively, if the 49ers lose at home this week to Atlanta, the Week 17 meeting in the desert would be a win-or-go-home scenario. None of those circumstances seem particularly likely. 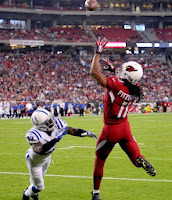 Indeed, Rob Hendryx's latest playoff probabilities gave the Cardinals a 17 percent chance going into the weekend, and Football Outsiders has dropped that number to 11.6 percent after this past week's games. Arizona is almost certainly one of the 12 best teams in the league, but they will likely be home come January. 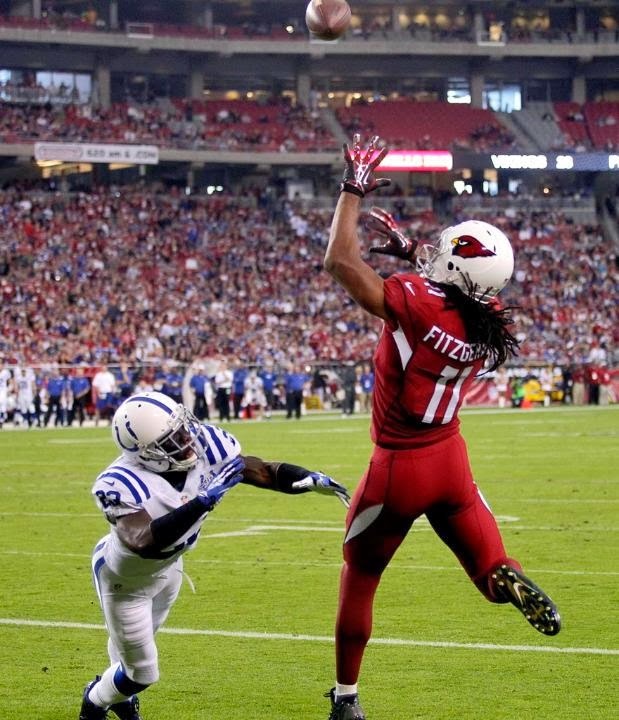 If the Cardinals are victims of circumstance, the Indianapolis Colts are beneficiaries of it. The AFC South is the only division without at least two teams at .500 or better, making Indy the first team to clinch their division this season. Still, winning the AFC South is like having the nicest trailer in a trailer park, and the Colts have been on a downward spiral for a couple months now. It's tough to pinpoint a direct cause for Indy's precipitous pass defense decline. The sacks are down on a per attempt basis, which is mostly a byproduct of Robert Mathis slowing down after a torrid first half. Mathis has accounted for 48.5 percent of the Colts' sacks this season, but 11.5 of Mathis' 16.5 sacks came before the bye. Without much of a pass rush to supplement him, a secondary that is perilously thin beyond Vontae Davis has gotten exposed. According to Pro Football Focus, Davis is the only defensive back to play more than 100 snaps on the season and post a positive pass coverage grade. Andrew Luck and the offense will take care of itself, particularly without the atrocious health luck they've experienced this season. But after Jim Irsay splurged on lots of mid-level free agent signings to bolster the defense this offseason, the Colts remain a bottom-half defense that lacks many significant difference-makers. People like to point out Romo's poor December record, but perhaps it's worth noting that the Cowboys defense has given up the eighth-most points in the league over their quarterback's career. At some point, doesn't there have to be an official #FreeRomo movement? - It's too little too late, but the Pittsburgh Steelers are finally rounding into form. Since an ugly 0-4 start, the Steelers have gone 6-4, even with just a 1-3 record in one-possession games over that span. Pittsburgh is 13th in Football Outsiders' weighted DVOA metrics this week, suggesting they are playing better than sixth-seed contenders Miami (18th) and Baltimore (20th). Pittsburgh is like a pre-adolescent going through an awkward growing phase, given their recent infusion of youth, but they do have a reasonable chance of maturing into a playoff team by 2014. - How are the Chicago Bears surviving defensively despite the deadly combo of a bottom-10 run and pass defense? The Bears continue to force turnovers, with a 3.8 interception rate that is tied with Kansas City for the fourth-best mark in the league. Chicago also forces the ninth-most fumbles in the league at 1.5 per game, but in fairness, Bears' opponents have recovered an above-average 61.9 percent of offensive fumbles. Relying on mistakes is not a sustainable long-term strategy, but it may very well net Chicago an NFC North title. Concerning the Bears defense and turnovers: while there is certainly reason to think that there is a lot of randomness to turnovers and that turnover rates should regress to the mean, the Bears certainly seem to be a team that is consistently above average in this regard. Seeing as they one of the oldest teams in the NFL, I wonder if there is a connection between veteran experience and turnovers. Their defense might not be able cover sideline to sideline and run down WRs as well a younger D (thus leading to big plays and a poor defensive rating), but they might be better able to diagnose the play and get in position to create offensive mistakes (thus creating turnovers). Looking at Arizona's performance, what jumps out at me about second half results is that their schedule has gotten much easier. In the first half, they played SEA, SF, NO, CAR, STL, TB, DET, and ATL; ATL is the only one of those defenses not above average by DVOA (and SEA, SF, NO, CAR, and TB are all top-8 pass defenses). In the second half they've played HOU, JAX, IND, PHI, STL, and TENN; all except STL are below average defensively by DVOA. Arizona has certainly improved, but the schedule has helped a lot too. I usually agree with the anti-Romo bashing sentiment and think it's gotten out of hand, but don't you have to take into consideration how many of those points allowed by the defense have come after a Romo turnover giving the opposition good field position? He has to be almost directly responsible for some of those points too during his career, although the D this year is particularly atrocious. Anon - EPA automatically adjusts for starting field possession (and automatically penalizes Romo for giving the opposing team good field position). Look at the EPA chart on the home page. Only Minnesota's defense has a worse number. 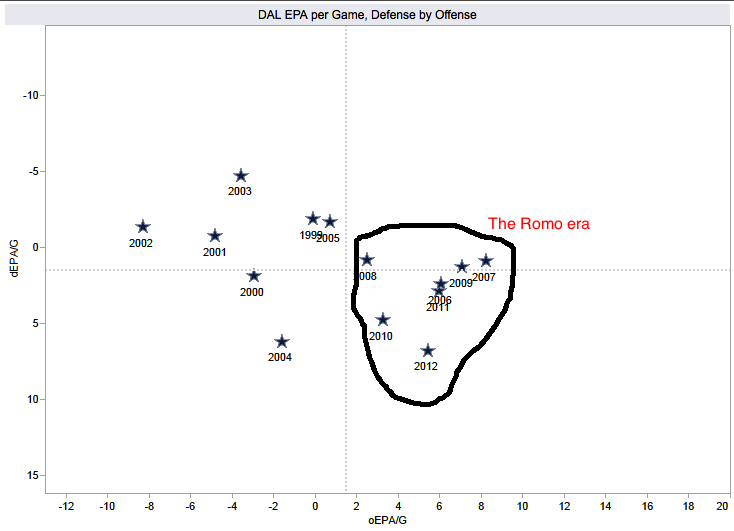 Mike - Was only wondering about the chart referenced in the article where Cowboy D's in the Romo era (2006-2013) have allowed the 8th most points. 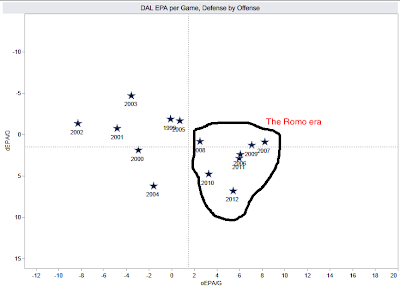 Curious how Romo affected that raw number. 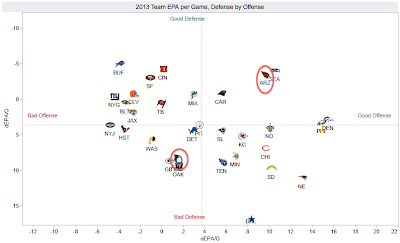 Again, I completely agree the defense is terrible this year, as shown on the EPA chart. FO found that DVOA covering the entire season was better at predicting playoff results. You can google it, should be available. Information by itself is useless, understanding how to use it gives it value. I see that the Chargers are alpha and omega, the first (in O Rank) and last (in D rank). Has that ever happened in any previous week? It's not happened before this season, but it's happened before in NFL history. Specifically, I'm sure it happened numerous times during the 2002-2004 seasons. The big showdown this week, the model has Saints -1.5 VS Panthers. Patroits -3.5 VS Ravens, the largest difference of the week between actual game spread. Browns -3.5 VS Jets, tied for largest difference with actual game spread. Look at it another way, Patroits GWP of .57 is .2 better than the Ravens .37. The Browns GWP IS .19 better than the Jets, and they are both underdogs in the game. Seahawks have a .2 GWP better than the Cardinals and the line is around -10.5. Subtract 6 points and put the Seahawks on the road and you have them favored by 4.5 instead of getting points like both the Patroits and Jets. They have the same GWP advantage over their opponent but are getting 7 additional points. The model is saying you have great value on these 2 teams this week. Interesting to note that with playoff positioning on the line last week, the previous no.1 ranked teams here all crashed and burnt. Down go the Saints, Broncos, and Bengals, the true no.1 team, Seahawks layed down the law. Seahawks should of been no.1 since week 5 or so each and every week, that would be predictive. The big showdown this week finds the previous no.1 and or no. 2 VS a team 11th last week, boy oh boy, won't look to good for this model if they go down and lose the division title. Momentum 4: How Streaky Are NFL Games? What Kind of Teams Are Super Bowl Winners? Should You Kick a FG on 3rd Down?